…And we’re done. 14 months after arriving in the post the second of my warriors of Poxton is done and dusted. Given the four month lay off since finishing my last Pestigor, I thought he turned out well. The miniature quality helps tremendously, Jes Goodwin’s work is always a joy to paint. 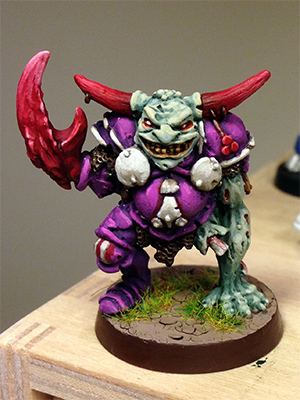 This chap is named Mal Blight, after Australian Football coach Malcolm Blight, who happens to have a particularly Nurglesque name. Two of my Warriors will be roadblock types while the other pair will take up killer roles. With his zoidberg claw, ol’ Mal here’s a killer. I’ve managed a couple of small sessions this week, the first since October last year Muscle memory is a wonderful thing, and I finally have a little bit of content for 2015. Its been a long time, I know. 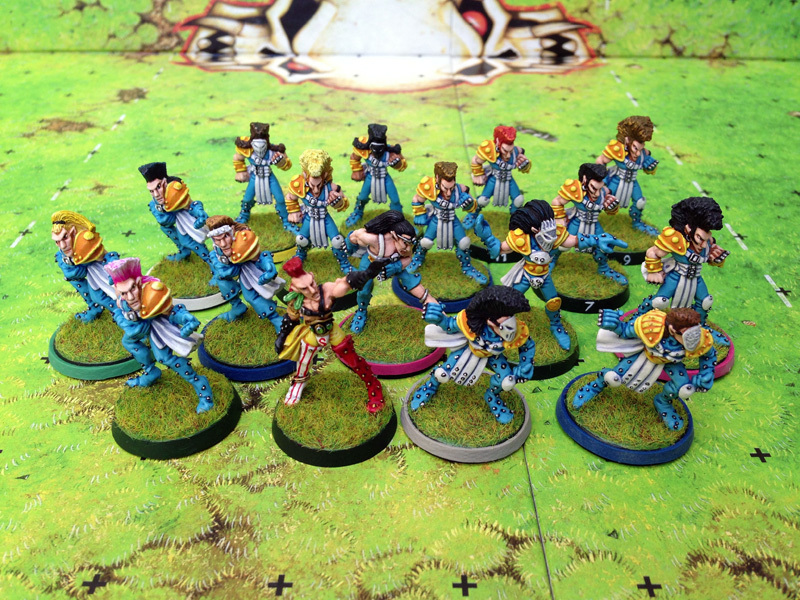 Work, winter, the World Cup, Blood Bowl tournaments and timetable changes due to Spieledeluxe becoming a trading entity had been taking higher priority than getting back to the hobby desk. 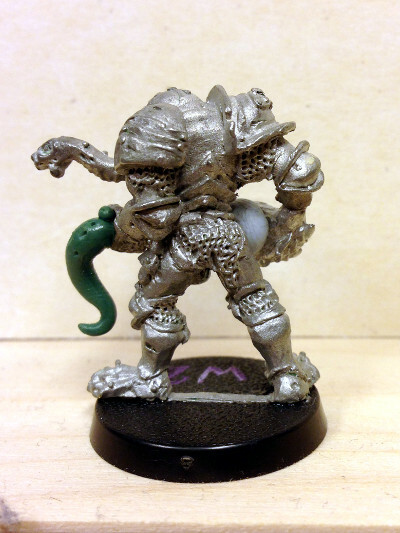 However, the MBBL does not rest for long and my new Nurgle team wants for conversion and painting. 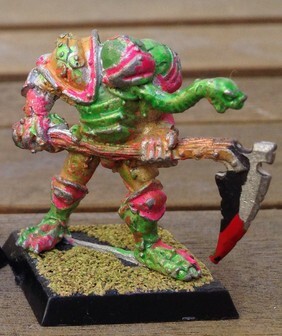 I’ve had three wins in the pre-season so far, (re)burying the nightmare I had with the Necros and I am excited to put a nice original scheme on my rotting scumbags. 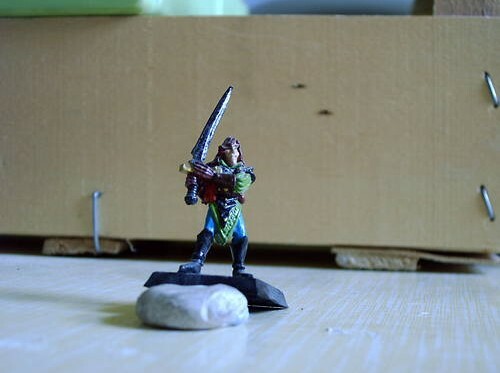 Still, you gotta convert before you paint and below is Helmut Grosswuerst, one of my four warriors. They are so repugnant that opponents will often refuse to block and risk dropping the ball if passing or catching nearby on account of their rank stench. 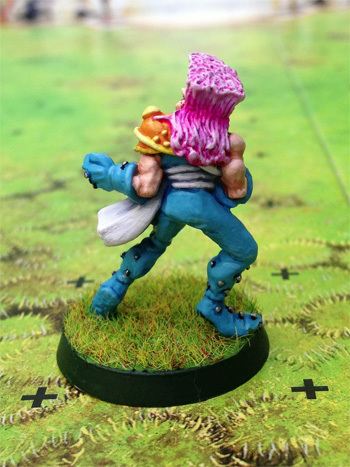 In addition to their high strength and armour, they also have a 50/50 chance of regenerating injuries – in short they are fabulous Blood Bowl players, and worthy of a fine paint job. Because Nurgle gets up to four of these titans, its worth building in-game with different roles. Tentacles can prevent players dodging away, while a Claw tears through an opponents armour. Helmut here has the best of both worlds, making full use of his unearthly gifts. There’s a little bit to go, some green stuff around the cuff of his right arm to even out the join between the claw. Otherwise I’m looking forward to putting some paint on him. 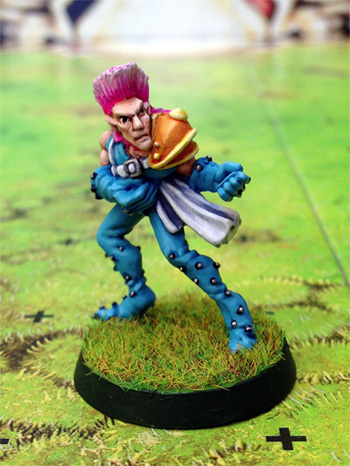 I’ve finally finished the 16th man of my Elf team, a pink haired catcher. It only took four years! 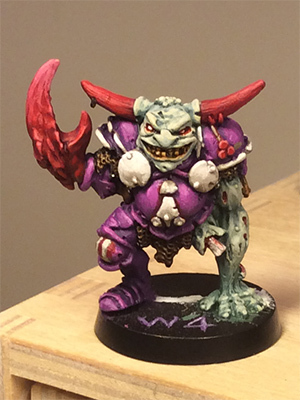 I’m pretty happy with him, I managed to keep the colours relatively consistent over such a long span. The paints are Vallejo, apart from the metallic which is GW Chainmail. Next, a shot of the complete side – with Eldril guest starring. And lastly, a recently unearthed shot of some of the previous paint schemes, captured back in early ’09. 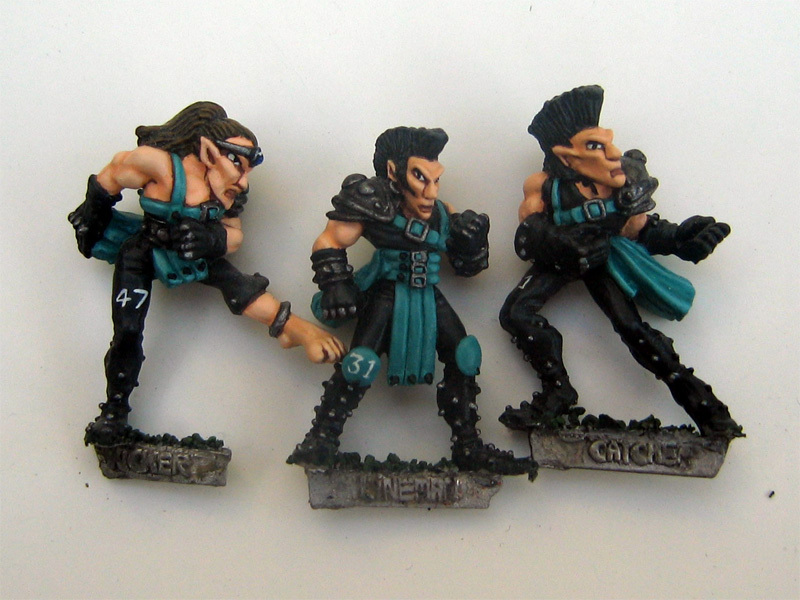 These minis were painted several times, with teal being strongly featured. I thought the eyes were pretty decent on these guys. 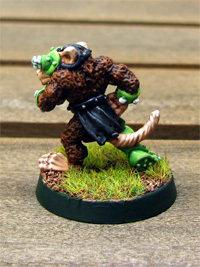 So, the skaven are a bit of a diversion from more pressing teams, but I really like dreaming up colour schemes and trying them out, especially on great minis like this team. I had anticipated the rats to be fairly straight forward, but this guy turned out to be a bit more of an adventure than anticipated. Preparation is really important with minis. 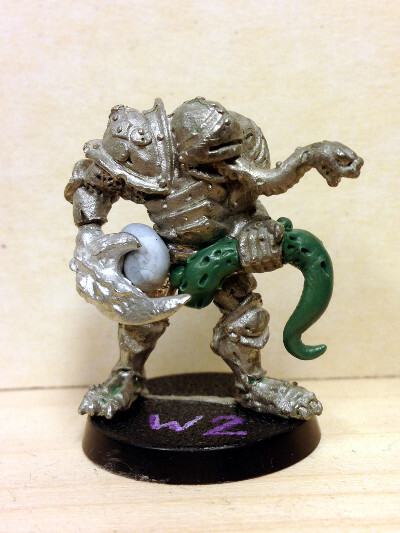 I am usually fairly patient, but for some reason I rushed mundane but important tasks with this Kicker turned Gutter Runner. The undercoat was badly done for a start, my normal “spraying” shoe box was filled with junk so I opted to use a smaller box that came to hand – too small in fact. You need to sweep the spray side to side, but I was limited to pointing the can directly at the figure due to the small receptacle. BAD IDEA as the coat was too thick, as I found out later when the paint started pooling on the surface. After painting him in a sweatbox, which the entire city of Melbourne has become after a zillion days of 30+ weather, my trusty Testors Dullcote metamorphosized into Testors Glosscote. Thankfully, I had some old Tamiya matt varnish left and I managed to salvage him with a coat. GRRR! 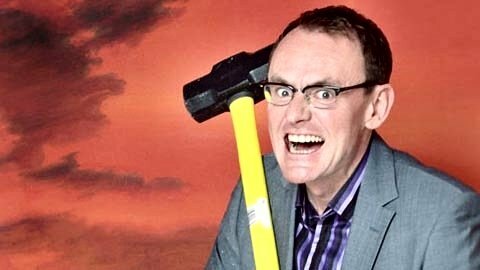 So, after several Sean Lock moments kicking myself, here’s the finished guy. I think he’s a recast actually as the mini detail is a bit blunted. Oh and we have a nice layer of cloud over the city making photography a bit more difficult – so the green is a bit more lurid than actual due to the flashlight photo. It’ll do. bullies, those with fragile egos and minimum wages – those are the guys that hide behind high armour and mighty blow. In a developed league, it takes a certain level of intestinal fortitude to put your hard won skills in the face of Chaos, Dwarf, and Chaos Dwarf wrecking crews week after week. After a while you get used to your team sheet looking like an emergency room, you start seeing opportunities – three journeymen next game can man the line of scrimmage and soak up hits your rostered players would take instead. 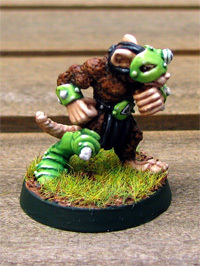 No team sums up fragile like Skaven. 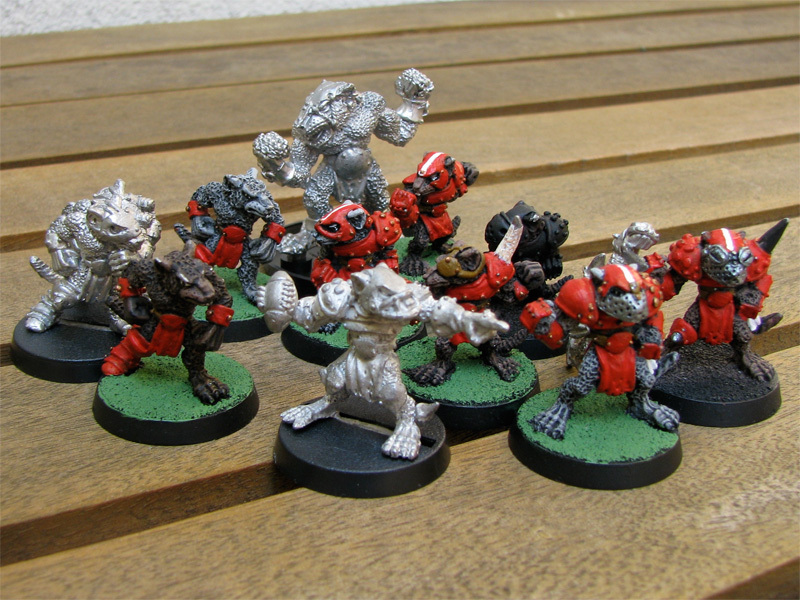 They are Blood Bowl’s glass cannon, blessed with a reasonable amount of agility, but a speed unmatched by any other team. All of this offensive firepower comes at the price of armour. These rats get beat up, badly most of the time! With Skaven, thats how it is – and when you gameplan for inbound pain, you can deal with it and Skaven on balance are actually pretty cheap to replace. I mean, they’re dirty rats after all, how pricy could they be? So, now that I’m suitably beaten-down from playing Elves I thought I might take a stab (pun) at painting the team I have. I picked up most of these chaps via ebay some years back, when they were only moderately overpriced. For the uninitiated, these are yet again Jes Goodwin’s work and like his elves no one has come within miles of sculpting a Skaven team close to his. Everybody knows this, hence this team will cost an arm and a leg to put together these days. The painted models will be getting a bath any day now, I have figured out a paint scheme that is 90% original – I haven’t seen any done like it, and I’m pretty enthused because rat fur is quick to paint. The anti, anti-hero. Bent, bowed, broken and clad in enamel. I wish Moorcock had made him a bit more rounded, especially since he wielded Stormbringer’s twin, the Mournblade. Too cool a name to be wasted on an insane lunatic.